The 369th Infantry Regiment was constituted 2 June 1913 in the New York Army National Guard as the 15th New York Infantry Regiment. The 369th Infantry was organized on 29 June 1916 at New York City. The infantry was called into Federal service on 25 July 1917 at Camp Whitman, New York. While at Camp Whitman, the 369th Infantry learned basic military practices. These basics included military courtesy, how to address officers and how to salute. Along with these basics they also learned how to stay low and out of sight during attacks, stand guard and how to march in formation. After their training at Camp Whitman, the 369th was called into active duty in New York. While in New York, the 369th was split into three battalions in which they guarded rail lines, construction sites and other camps throughout New York. Then on 8 October 1917 the Regiment traveled to Camp Wadsworth in Spartanburg, South Carolina, where they received training in actual combat. Camp Wadsworth was set up similar to the French battlefields. While at Camp Wadsworth they experienced significant racism from the local communities and from other units. There was one incident in which two soldiers from the 15th Regiment, Lieutenant Europe and Noble Sissle, were refused by the owner of a shop when they attempted to buy a newspaper. Several soldiers from the white, 27th Division came to aid their fellow soldiers. Lieutenant Europe had commanded them to leave before violence erupted. There were many other shops that refused to sell goods to the members of the 15th Regiment, so members of the 27th and 71st Divisions told the shop owners that if they did not serve black soldiers that they can close their stores and leave town. The white soldiers then stated "They're our buddies. And we won't buy from men who treat them unfairly." 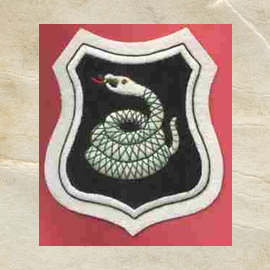 The 15th Infantry Regiment NYARNG was assigned on 1 December 1917 to the 185th Infantry Brigade. It was commanded by Col. William Hayward, a member of the Union League Club of New York, which sponsored the 369th in the tradition of the 20th U.S. Colored Infantry, which the club had sponsored in the Civil War. 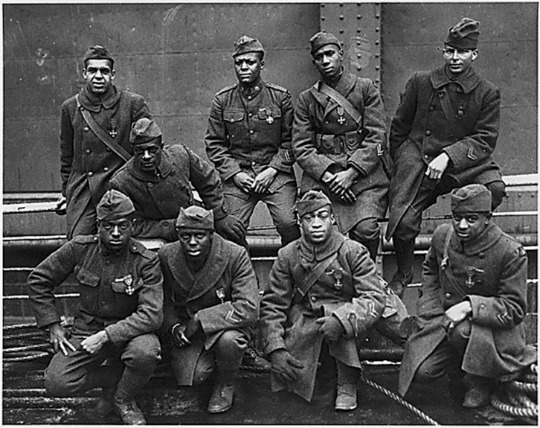 The 15th Infantry Regiment shipped out from the New York Port of Embarkation on 27 December 1917, and joined its brigade upon arrival in France. The unit was relegated to labor service duties instead of combat training. The 185th Infantry Brigade was assigned on 5 January 1918 to the 93rd Division [Provisional]. The 15th Infantry Regiment, NYARNG was reorganized and re-designated on 1 March 1918 as the 369th Infantry Regiment, but the unit continued labor service duties while it awaited the decision as to its future. The US Army concluded on 8 April 1918 to assign the unit to the French Army for the duration of the United States' participation in the war. The men were issued French helmets and brown leather belts and pouches, although they continued to wear their U.S. uniforms. While in the United States, the 369th Regiment was never treated like similar all white units. They were subject to intense racial discrimination and were looked down upon. In France, the 369th was treated as if they were no different from any other French unit. The French did not show hatred towards them and did not racially segregate the 369th. The 369th finally felt what it was like to be treated equally. The French accepted the all black, 369th Regiment with open arms and welcomed them to their country. The 369th Infantry Regiment was relieved 8 May 1918 from assignment to the 185th Infantry Brigade, and went into the trenches as part of the French 16th Division. It served continuously to 3 July. The regiment returned to combat in the Second Battle of the Marne. Later the 369th was reassigned to Gen. Lebouc's 161st Division to participate in the Allied counterattack. On one tour they were out for over 6 months which was the longest deployment of any unit in World War I. On 19 August, the regiment went off the line for rest and training of replacements. While overseas the Hellfighters saw propaganda intended for them saying that the Germans have done nothing wrong to blacks so why are they against the Germans, and that they should instead be fighting against the Americans. These statements only made the Hellfighters even more devoted to the U.S.
On 25 September 1918 the French 4th Army went on the offensive in conjunction with the American drive in the Meuse-Argonne. The 369th turned in a good account in heavy fighting, sustaining severe losses. They captured the important village of Séchault. At one point the 369th advanced faster than French troops on their right and left flanks, and risked being cut off. By the time the regiment pulled back for reorganization, it had advanced fourteen kilometers through severe German resistance. In mid-October the regiment was moved to a quiet sector in the Vosges Mountains. It was there on 11 November, the day of the Armistice. Six days later, the 369th made its last advance and on 26 November, reached the banks of the Rhine River, the first Allied unit to reach it. The regiment was relieved on 12 December 1918 from assignment to the French 161st Division. It returned to the New York Port of Embarkation and was demobilized on 28 February 1919 at Camp Upton at Yaphank, New York, and returned to the New York Army National Guard. the 369th Regiment was not allowed to participate in the Victory Parade of 1919. They were also disrespected by not being given a salute by the MP's who were under orders not to. Photographs show that the 369th carried the New York Regimental flag overseas. The French government awarded the regiment the Croix de Guerre with Silver Star for the taking of Séchault. It was pinned to the colors by General Lebouc at a ceremony in Germany, 13 December 1918. One of the first units in the United States armed forces to have black officers in addition to its all-black enlisted corps, the 369th compiled a war record equal to any other U.S. infantry regiment. It earned several unit citations along with many individual decorations for valor from the French government. The 369th Infantry Regiment was the first New York unit to return to the United States, and was the first unit to march up Fifth Avenue from the Washington Square Park Arch to their armory in Harlem. Their unit was placed on the permanent list with other veteran units. In re-capping the story of the 369th Arthur W. Little, who had been a battalion commander, wrote in the regimental history From Harlem to the Rhine, that it was official that the outfit was 191 days under fire, never lost a foot of ground or had a man taken prisoner, though on two occasions men were captured but they were recovered. Only once did it fail to take its objective and that was due largely to bungling by French artillery support. So by the end of the 369th Infantry's campaign in World War 1 they were present in the Champagne – Marne, Meuse – Argonne, Champagne 1918, Alsace 1918 campaigns in which they suffered nearly 1500 casualties. The 369th also fought in distinguished battles such as Belleau Wood and Chateau-Thiery. While fighting these battles, they served nearly six months on the front lines and earned many distinguished awards. These awards included the Croix de Guerre which is France's highest military honor.